Want to be a trendsetter? 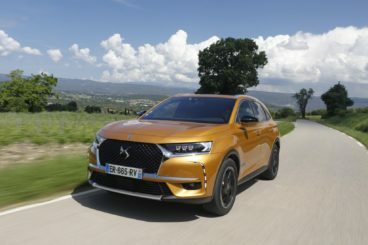 The new DS 7 Diesel Crossback Hatchback is evidence that the DS brand – once joined at the hip with Citroen – can go it alone. While it’s a typical large family car in many ways – seating five people in comfort and offering lots of practicality – it’s also luxurious, has flair, and a real upmarket feel. The problem it has right now is that the car is totally brand new, while the DS brand is hardly established. Will DS be able to convince buyers that this is worth their cash over the likes of a BMW? Are you ready to set trends? OSV takes a closer look at what it’s all about with our 2018 DS 7 Diesel Crossback Hatchback review. Sizeable cars like these are never the most accomplished handlers, and no one buys them for their drivability. However, they’re generally good in bends. Does the Crossback pass this particular litmus test? It does, and the fact that it shares its platform with the excellent Peugeot 3008 helps here. It’s also a comfortable car that offers safe, predictable handling – two things that help to build your confidence, especially when you take corners with a bit more pace. However, this is far from what you’d call a driver’s car. The steering is just too light for that, and it’s not as accurate as we’d prefer. It also lacks feel, and this can create that dreaded sense of detachment. It’s actually a bit of a shame that the Crossover won’t be exciting anyone because DS is a brand that buyers and motor journalists have been getting a bit giddy about. In two words, though, this car is acceptable on the road – but underwhelming. In terms of its engines, two diesels are available at the moment, with more anticipated. The smallest of the two is a 1.5-litre BlueHDi 130 unit that develops 128bhp. It’s paired up with a manual transmission and takes around 11.0 seconds to complete the 0-62 dash. That’s not too bad but it’s well off the pace of the bigger 2.0-litre BlueHDi 180 diesel. This engine is mated to an 8-speed automatic ‘box as standard and can get you from rest to 62mph in 9.9 seconds. That sounds quick on paper but there are plenty of rivals that are significantly quicker. Drivers can flick between four different driving modes, with Sport mode pumping an artificial engine noise through the speakers. It’s as odd as it sounds to you right now. DS have crafted a genuinely luxurious cabin here, with the French brand saying that they want their car to put people in the mind of the likes of Louis Vuitton. To that end, they say that the materials and trims they’ve used are very Parisian. 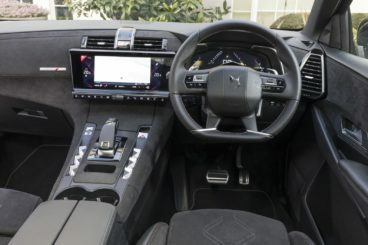 This means that the cabin is rather traditional in terms of its aesthetics, although this approach is undermined somewhat by the high-tech gadgets and gizmos, such as a massive 12” TFT screen that dominates the dashboard. Another large infotainment screen flanks the instrument panel, and this controls most of your car’s basic functions. All the controls work well enough, and the buttons are solid and simple to operate (once you’ve got used to them). All in all, this cabin isn’t too radical or alienating – it’s just more luxurious than Peugeot and Citroen buyers will be used to. It’s a comfortable cabin too, with the suspension setup ensuring a cosseted ride at high speeds. It’s not quite as comfortable in the towns and cities, but it’s bearable. To get the best out of its ride quality, it’s well worth adding Active Scan Suspension and putting it in standard mode. Is the DS 7 Diesel Crossback Hatchback practical? It’s a fairly sizeable family car that can fit five people, but it isn’t so big that it’s hard to drive or park. Moreover, when it comes to parking DS have fitted lots of driver aids. Space-wise, it compares well with rivals at this price point. The floor is flat, and this allows even the middle seated passenger some room to stretch out. Headroom is good and we can’t see many passengers complaining on longer trips. There’ll be no complaints about the boot either. It measures 555-litres with all the seats up and 1,752 when you fold the rear seats. DS have been generous with the amount of kit they’ve put together as standard. The entry-level model comes with a leather-trimmed gear knob and steering wheel, LED front fog lights and rear parking sensors and 18” alloys. It misses out on a 12” touchscreen, however. The Performance model adds 19” alloys, sat-nav, a 12” touchscreen, heated front seats, Alcantara on the dash, door panels and seats, and tinted windows. Next is the Prestige model, which nets you 20” wheels, a B.R.M clock, wireless charging and LED ambient lighting, more leather, while the Ultra Prestige model rounds things off with a panoramic sunroof, and an enhanced stereo system. Safety-wise, the car has a 5-star safety rating and its standard kit includes driver fatigue monitoring, lane departure warning, and lane keeping assistance. Prices for the new car start at £27,855 and rise to £43,320. For more information on our leasing deals, you can check out our page here. In terms of its running costs, the 1.5-litre diesel engine is the most economical in the range. It can return 68.9mpg at best, which makes it one of the most affordable cars to run in this sector. The bigger 2.0-litre diesel, meanwhile, is good for 56.9mpg at best and has a BiK rating of 30%. It represents a big step up from the likes of Citroen and Peugeot where mainstream cars are concerned. It’s almost unheard of for such an upmarket large family car like this to return more than 68mpg economy. It’s spacious and its boot is generously proportioned. Compared to rivals, the Crossover’s engines are both slouches. With a lack of a reputation comes a lack of badge appeal, heritage – and reliability records. Let’s see how the car fares against its rivals in the comparison section of our 2018 DS 7 Diesel Crossback Hatchback review. The new BMW X3 is a bulky but handsome family car that handles as well as you’d expect a BMW to handle. Indeed, it doesn’t seem to matter how big a BMW is, they all adhere to the “ultimate driving machines” principles. BMW took the Jaguar F-Pace as their blueprint when creating this car, and while the X3 isn’t quite as scintillating as the Jag, it’s a lot more involving, rewarding and entertaining than the DS. It never feels like the heavy car it is, the steering is well weighted (if a tad elastic in the towns and cities), and it’s also capable off-road, too. In terms of its engines, a 2.0-litre diesel unit kicks things off. It produces 188bhp of welly, which can get you from rest to 62mph in 8.0 seconds flat. That makes it a lot faster than the Crossback. It’s a refined engine that comes paired up with an 8-speed automatic transmission as standard. Rounding off the small diesel range is a 30d model that develops a crushing 261bhp. 0-62 is taken care of in 5.8 seconds, and it’s fair to say that it has the DS on toast. Running costs? Because the engines are so modern, you won’t get hit as hard in the pocket as you might have anticipated. The 2.0-litre diesel can return an impressive 56.5mpg on a good day and has a BiK rating of 31%. The bigger 30d model manages 49.6mpg at best and has a BiK rating of 34%, thanks to emissions that almost scrape 150g/km of CO2. Inside, the X3 is gorgeously put together. Fit and finish is exquisite, comfort is a lot better than last time thanks to improved ride quality, and there are plenty of soft-touch plastics in use. Leather is also on display on all models, while buyers can choose between aluminium or gloss black touches. The dashboard, meanwhile, is a pleasingly fuss-free affair. 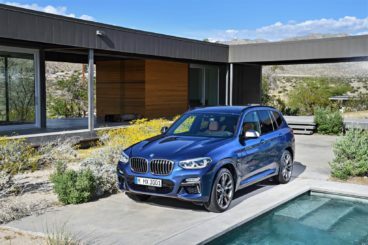 Is the BMW X3 practical? This is a sizeable cabin that’s got plenty of room for five people. In fact, there’s almost as much space in here as there is in the bigger X5. Leg and headroom is fine for all, access is good, and it’s super easy for the driver to find the right position. Shoulder room in the rear is the only criticism – it will get a bit tight when all three rear seats are taken up. A 550-litre boot is on par with the DS, and it increases to 1,550-litres when you fold the rear seats. The new Mazda CX-5 is stylish and great fun to drive. Mazda continually produce cars that are entertaining on the road, and this big family car is no different. If you’re making the step up from a small hatchback but want a car that still handles like a small hatchback, the CX-5 is one to look closer at. It’s a heavy car but it’s remarkably responsive, obeying your commands without any drama. The steering is nice and precise, and there’s plenty of grip on offer. In terms of its engines, not much has changed since last time. A 2.2-litre diesel is still the sole diesel offering, and it’s still available with either 148bhp or 173bhp. Mazda have tweaked both variants, with the latter now quieter than its predecessor. It’s also really eager to rev and can haul you from a standstill to 62mph in 9.0 seconds flat. The former is a bit slower but still a very competent engine, and it comes mated to a slick shifting 6-speed manual gearbox. Both engines, meanwhile, can be specified with four-wheel-drive if you wish. Running costs? The 148bhp diesel variant can return 56.5mpg on a good day, emits 132g/km of CO2 and has a BiK rating of 28%. Adding four-wheel-drive will knock its economy down to 52.3mpg, which still seems reasonable. The bigger diesel is just as economical but costs more to buy. Inside, there are plenty of tactile materials here and there to get excited about and the CX-5 feels like a genuinely upmarket product. It’s super well insulated, smooth and a great place to be. Its dashboard looks fantastic, and while it doesn’t look much different to last time, the cabin as a whole has received an upgrade in quality. 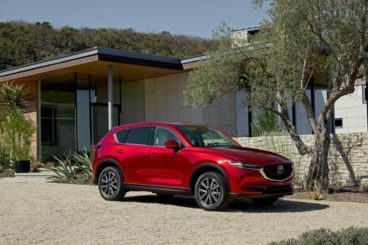 Is the Mazda CX-5 practical? Despite its size, it’s not quite as roomy as the DS. It’s also not got as many storage solutions, although it’s hard to argue with the size of either the central storage compartment or the glovebox. Headroom is fine for all, but rear legroom is a bit sparse. The boot, meanwhile, measures 506-litres. Fold the rear seats and it extends to as much as 1,620-litres. This is a really forward-thinking car from DS that could – and should – set the cat among the pigeons in the upmarket large family car sector. Free from Citroen’s shackles, its cabin shines with quality, it’s stylish and you don’t need to have any concerns on the practicality front. If you’re willing to give the new brand a try and be a trendsetter, the DS 7 Diesel Crossback Hatchback won’t disappoint.